Brio Railway standing the test of time everywhere! Christmas 2012, Sarah’s brother kindly bought a brio rail and road wooden train set for his 17 month old only nephew. We were really impressed with the quality of the product – the wooden track pieces, the trains and the included plastic accessories are very durable. A traditional design that never goes “out of fashion” and we foresee years of play out of it! It soon became clear that the one set was not quite enough to really inspire Oliver’s play. As it was Christmas, like most families we couldn’t afford to buy any more brio for a while yet. Sarah decided to try our luck and see if anyone local had any going unused. She posted on a couple of local facebook selling pages: “wanted: brio track/trains” and had one reply within a few minutes. This guy, that lived 10 minutes away, said he had a huge amount of wooden track and trains, with other accessories. He guessed there was around £280 worth in his son’s collection that was no longer used. would we like it for £90? It’s fair to say, we love a good bargain; so I went to pick it up and was astounded at the amount of gear there was! 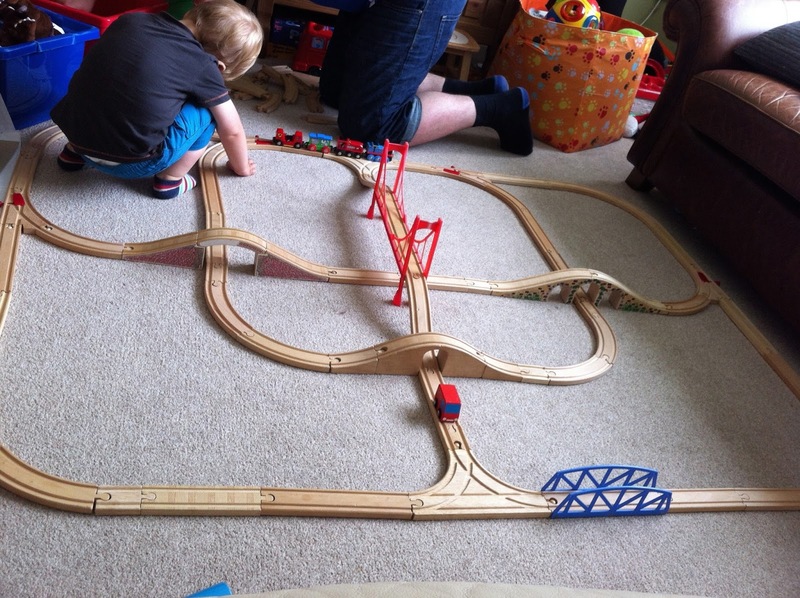 This really gave a true picture as to how durable and well-lasting the BRIO sets are – the guy we bought the lot off had collected over a period of 6 years and most looked still unused! Oliver soon learned how to say “track” and “trains” and at only 18 months, he was telling us he wanted to play with them and if we could build him a train track. He is obsessed with letting the small trains build up momentum themselves by having many bridges included in a track. 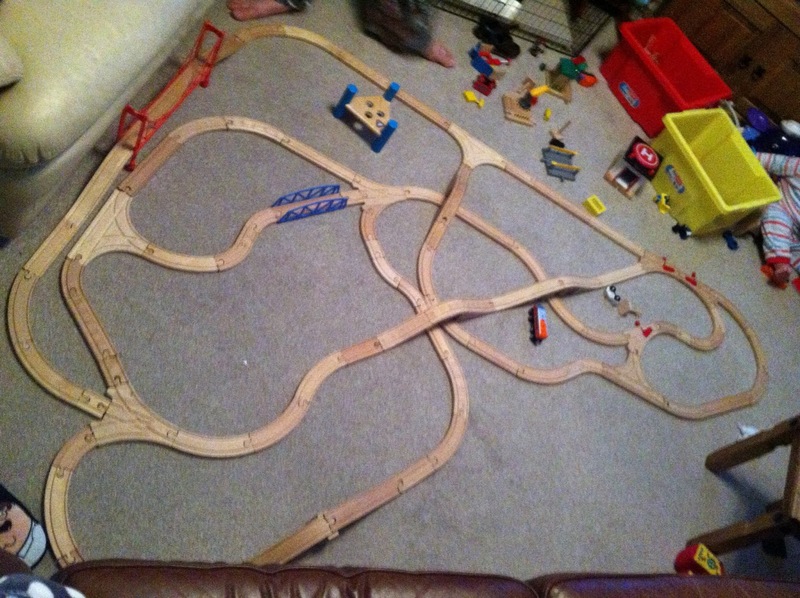 I am by far the superior track builder, Sarah will openly admit she’s rubbish at it! But as Oliver has gotten older, he has now worked out how to put pieces together himself. We are insanely proud of him as his fine motor skills continue to develop. We have since added to Oliver’s collection; and you’ll never be stuck for ideas when relatives ask what you’d like them to buy for your tot for their birthday or christmas! The Toadstool: That dad is seriously skilled at track building! I love tracks and always build some for our little nearly 2 year old (4 more sleeps), however Mr Toadstool gave it a try here and looked so much better then mine straight away – without practise. I was so gutted as I LOVE trains. Totally addictive ! Any other household where the dads perform better at Track building? Any one else wants to share some wooden train love in the shape of a guestpost? Even if you are not a blogger you can, just send us an e-mail with your wooden rail story and attach some pictures with or without the kids on them! ← I just can’t imagine a home without a train set. What a boring place that would be.